DS Construction and Maintenance, Inc.
JEO Masonry & Tile, Inc. Comment: Remove exiting pavers and install a better look. Comment: Current asphalt driveway cracked and deteriorated. Water pooling present and water flowing into basement. Comment: We need a new sidewalk installed in front of our house. Currently there is no walkway, only dirt. There are sidewalks in front of the houses on either side of us, so our property is just a gap that needs to be filled. It is approximately 30 feet in length. We would like basic sidewalk, no curbing. Comment: We need to make an asphalted parking space in front of the car for one car only. Comment: I have set of 5 steps, 4 of them rise 8", the fifth rises 10" Need to add 2" slab to 4 steps, so I'll end up with an 8" rise on all steps. SRS Construction and Landscape, Inc.
Watertown Concrete Contractors are rated 4.71 out of 5 based on 1,278 reviews of 61 pros. 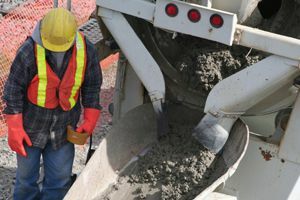 Not Looking for Concrete Contractors in Watertown, MA?